Are you wondering what to make or do for dad this Sunday on Father’s Day? Well, look no further here is an absolute super delicious and healthy recipe to put together for that special man in our lives ……our FATHER. Basmati-Rice Stir-Fry with Marinated Tofu just the way it sounds …all time best rice in the world “Basmati Rice and tofu chucks marinated into a special sauce, stir-fried with colorful vegetables. An excellent dish for the whole family to agree on. 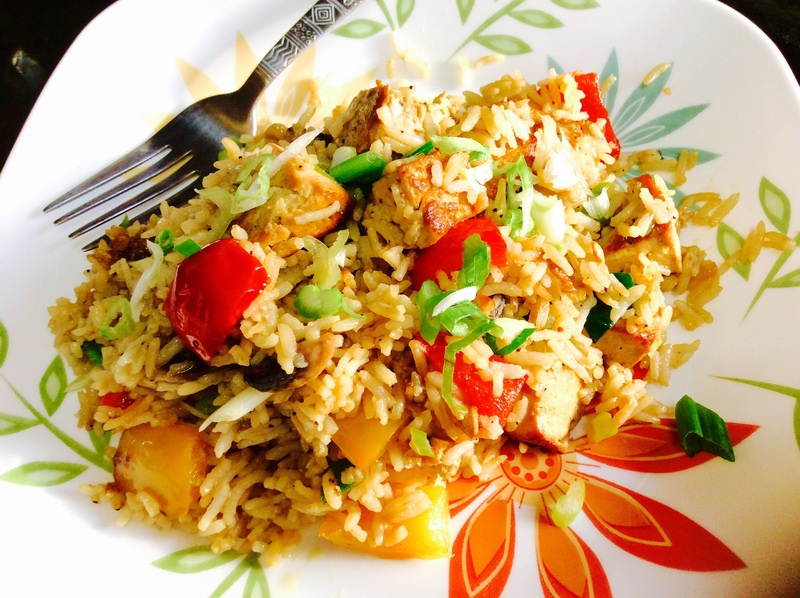 Celebrate Father’s Day with this marvelous, scrumptious, flavorful dish Basmati-Rice Stir-Fry Marinated Tofu. Stir-fries are one of the best meals to make …their super fast, makes good use of fresh vegetables, and get their flavoring from the most basic items like soy sauce, garlic, ginger and chili sauce. 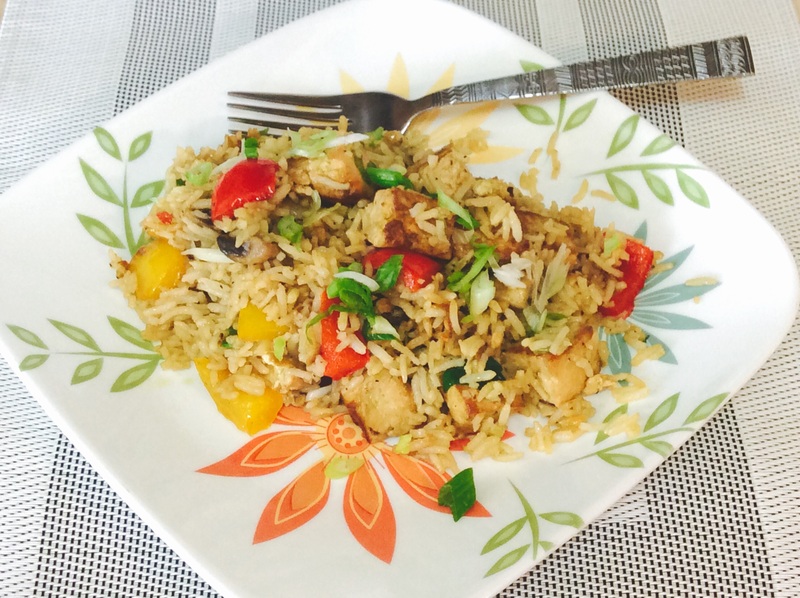 This dish is a complete meatless …pure vegetarian dish, egg free version. It’s made with scrumptious marinated tofu, colorful bell peppers, mushroom, ginger, garlic, soy sauce, sesame oil and seasoning. This recipe can particularly work with any choice of vegetables liking broccoli, string beans, carrots, snap peas and bok choy. To be honest, I was not a great stir fry fan and wasn’t very fond of tofu. Growing up my family wasn’t into any Asian Food, so I didn’t always have that opportunity to explore the world of Asian Food. I had mentioned before that I hail from a very traditional Gujarati family and grew up with my grandmother, so she had no idea how to even make Asian Food …. let alone “stir fry”. It was always the full authentic traditional Gujarati food ……which I always enjoyed and always will. “Ba (grandma) miss you ! My first discovery into Asian Food came when I met my husband..back then he was my fiance. We explored many different restaurants, cuisines and foods and that was the first time I had tasted the best tofu in the world. I could not believe that tofu could be this tasty…I was in heaven! Can’t remember the name of the dish, but truly remember that I didn’t even know that I was eating tofu cause it was so well prepared. The texture and flavors were mouth-watering. Now, I’ve started to master all of the great Asian Cuisines Foods, so I like to use Tofu in all my dishes …will I try to use. I sometimes substitute paneer for tofu and go the healthy way in cooking. For my kids Asian Food is no secret, I have always introduced them to many different cultural foods. They are very kin and love any kind of stir-fry especially stir-fried rice. 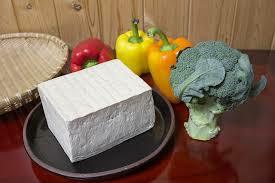 Vegetables sometimes becomes a challenge, but I secretly get them to eat it ….. tofu they have no problem. For this recipe I had made a very basic five ingredient marination sauce ,but the basic trick is in removing the excess water from the tofu, this will help the tofu stay nice and firm. Completely, drying the tofu helps when grilling or baking the tofu at a high temperature, it creates a nice golden brown, tougher texture somewhat of a “meat-texture” like my husband would say! Marinating the tofu for about an hour in room temperature helped the tofu absorb and soak in all of the delicious sauces,which was far more appetizing in the texture and taste department. The basic sauce recipe that I’ve used here for the tofu marination is very versatile and be changed up to your liking or use it as is. This method that I’ve used goes extremely well in many of the stir-fry dishes or salads. I’m hoping to incorporate this same method of tofu marination and sauce in other dishes and see how well versatile the tofu will be. So far what I’ve tasted and feedback from my family has all been completely positive, so I have high hopes. Basmati-Rice with Marinated Tofu made tasty with a simple technique that gives the tofu perfect texture and flavor stir-fried in delicious Basmati-Rice and colorful vegetables. A complete and healthy,delicious weeknight/weekend meal. 3 - Springs Green onion. cut halved lengthwise and thinly sliced. Pressing Tofu to remove excess water to make tofu become more denser and firm. Cut tofu into 1 inch slices, lay flat on a baking sheet or plate lined with a double layer of paper towels. Then place two more clean paper towels on the top of the tofu and cover with either baking sheet or plate. Weight it down with a heavy skillet, pot or canned goods. Let it sit for at least 30 minutes. Combine all of the ingredients for the "Tofu Marinated Sauce" into a blender jar. Blend til a smooth consistency paste has been formed. Add a little water if need be to combine. Cut tofu into desire size. Combine tofu pieces and sauce together, make sure all tofu pieces are coated evenly. Cover and keep aside and let marinate for 30 minutes at room temperature. In a wok or large skillet, heat up canola oil over medium-heat. Once hot add in garlic and ginger; saute,stirring until fragrant. about 30 seconds. Then add in tofu, and let it cook, stirring in between until tofu is golden brown all over, about 5-8 minutes. Add in the bell peppers,mushrooms; cook, stirring, until the peppers are crisp-tender. About 4-5 minutes. Add in rice, soy sauce and Sriracha hot sauce (optional) mix well; cook, stirring frequently until rice is completely heated through. Then add in sesame oil, season with salt to taste and pepper;mix well and cook for another 2 minutes. It is very delicious. Combination of all ingredients gives unique taste of the rice.Tofu makes it cherry on the top.